The Golden Globes aren’t the Academy Awards or the Super Bowl, but the ceremony is definitely one of the top five annual events where people dress up nice and gather around to receive at least one trophy. This year’s show started on a particularly good note, with hosts Andy Samberg and Sandra Oh performing a very playful introduction to the ceremony that poked fun at previous award shows while giving space for a heartfelt message about ongoing changes in the culture of Hollywood. 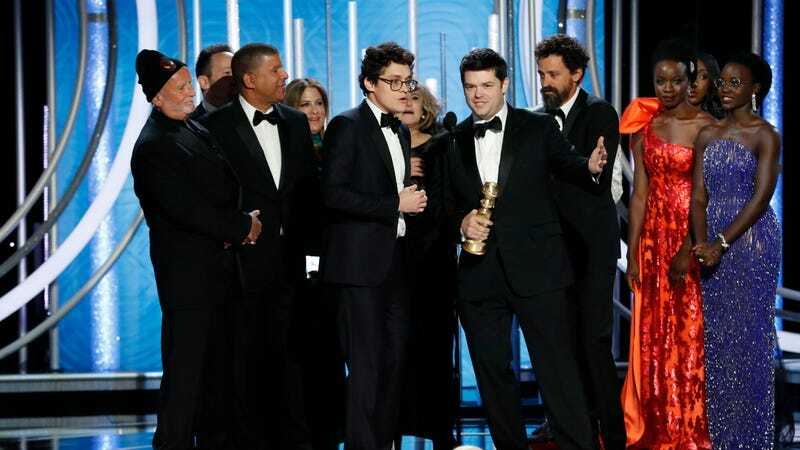 The awards themselves also kicked off nicely, thanks to Spider-Man: Into The Spider-Verse pulling out a surprise win against Wes Anderson’s Isle Of Dogs and Pixar’s The Incredibles 2, and there are certainly a ton of TV fans out there who were happy to see The Americans honored as the Best TV Drama. As the night went on, more of the awards seemed like they couldn’t have possibly gone anywhere else: “Shallow” from A Star Is Born obviously won Best Original Song, Sandra Oh continued her ownership of the evening by beating Julia Roberts for Best Actress in a TV drama, and Roma won both the Best Foreign Language category and Best Director for Alfonso Cuarón. As for surprise wins, we certainly didn’t see The Kominsky Method beating Barry, The Good Place, and The Marvelous Mrs. Maisel for Best TV Comedy. We also didn’t see Green Book winning the sheer volume of Globes that it’s taking him, including the award for best musical or comedy film. Plus, it might not really count as upset, but good on Darren Criss for beating out a whole bunch of famous people to win his Best Actor In A Limited Series award. Then, at the end of the night, Rami Malek kicked off a pair of big wins by nabbing Best Actor and Best Drama for Bohemian Rhapsody. The full list of winners and nominees is below, with winners bolded as they’re announced.